Oliver Goldsmith’s witty and warm-hearted comedy has been delighting audiences for nearly 250 years. Hardcastle, a country squire, is expecting the arrival of Marlow, the son of an aristocratic friend he’d like to introduce to his daughter Kate, with a view to marriage. But thanks to Hardcastle’s mischievous stepson Tony Lumpkin, Marlow mistakes his prospective father-in-law for an innkeeper, and Kate for the barmaid. The good news is, while Marlow is entirely tongue-tied and incapable of eye contact with a lady of his own class, he’s an absolute charmer with women of a different stamp. And so, as Hardcastle’s indignation intensifies, Kate’s appreciation for her misguided suitor soars, as she hides her true identity and ‘stoops to conquer’. Meanwhile Marlow’s friend Hastings is in love with Kate’s cousin Constance. But standing in their way is Constance’s aunt and guardian, the selfish and vain Mrs Hardcastle, who wants her niece to marry her son Tony so that Constance’s inheritance of valuable jewels stays in the family. Chaos and confusion ensue in this classic comedy of errors! 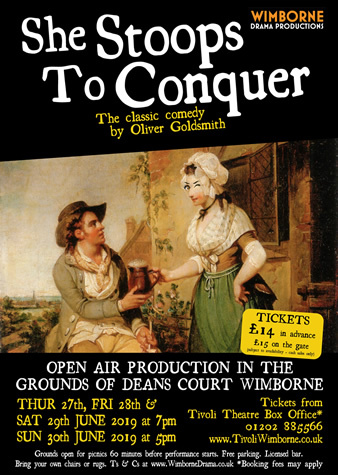 Come and join us in the glorious grounds of Deans Court to watch one of the great comedies of the English language. Directed by Richard Neal. Grounds open for picnics 60 minutes before performance starts. Vehicle access ONLY via Poole Road (BH21 1QF). Pedestrians ONLY via the Deans Court Lane entrance (BH21 1EE). Free parking. Licensed bar. Please bring your own rugs or low-backed seating. Performances will continue in most weather, including wet weather, so bring appropriate clothing. Refunds will only be issued in the unlikely event that a performance is cancelled before the play starts. Please see Conditions of Sale. Guy Haines and Charles Bruno meet on a train. Because they're strangers they "can say anything they like" to one another. Bruno proposes the perfect murder: he will kill Guy's unfaithful wife if Guy will kill his much-hated father. Guy never imagines Bruno is serious. But Bruno is deadly serious. Phyllis Spencer directs this tense psychological thriller.